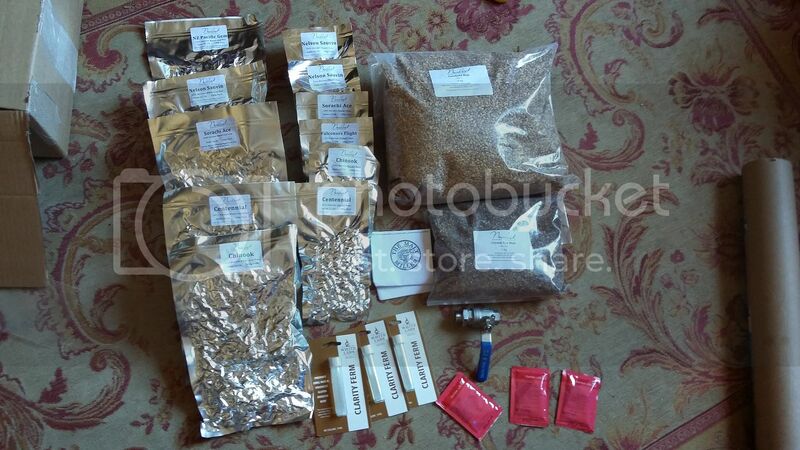 The Brewing Forum • View topic - What can I brew with this lot? What can I brew with this lot? Got my birthday order today. What shall I make? I also have a sack and a bit of Maris otter. Re: What can I brew with this lot? What's the bigger malt? Rye? Cheers Duncans. Its caragold. The smaller one us rye crystal. 14.0 g Centennial Leaf (13.5% Alpha) Dry hop"
Yarp! I forgot to say I'm aiming for 70 liters at a time. Whole hops in the kettle and pellets for dry hopping. I tend to split the batch into 3 fvs and do slightly different things in each. Good idea, might have crack without the really dark malts, I'm not a fan of them! But I do really like the rye crystals roastyness! I'm looking at brewing this... Its going to be split between a couple of fvs and heavily dry hopped with the same hops, in different quantities. Gem is a nice 10/15 min hop and will add a unique flavour to your beer. Berry-ish and Woody. But if you're using different hops I'd just use a bittering addition personally and dry hop the crap out of them.